HOUSTON (AP) Los Angeles manager Mike Scioscia called Martin Maldonado the star of the game on the defensive side. 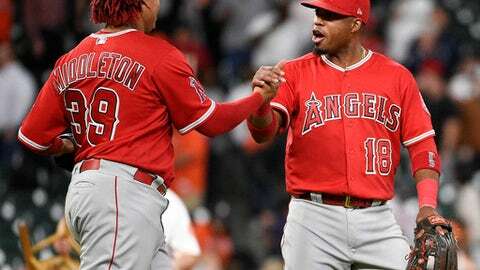 Maldonado threw out Yuli Gurriel at third base to end the game after an original safe call was reversed on replay, giving the Angels a big 2-0 win Monday night over a division rival that ended the Houston Astros‘ six-game winning streak. Gurriel singled off Keynan Middleton leading off the ninth inning. Alex Bregman then walked. After a pair of strikeouts, Middleton threw a slider in the dirt to Max Stassi that bounced off Maldonado’s leg toward third base. The catcher pounced on the ball and threw to third where Luis Valbuena tagged Gurriel, who slid head first. Umpire Cory Blaser signaled safe. After the replay was shown on the video board, fans started filing out even before the out call was given about 90 seconds after the tag. Middleton earned his sixth save. On Sunday, Blaser called Colorado’s Nolan Arenado safe at home plate trying to advance on Brandon Morrow’s bases-loaded slider in the dirt at Wrigley Field. That call was then reversed on replay for the final out in the Chicago Cubs’ 9-7 win. Astros manager A.J. Hinch said Maldonado is the reigning American League Gold Glove Award winner for a reason. ”It’s a tough way to end the game, but I can’t fault Yuli for trying to be aggressive,” Hinch said. ”It’s a result-oriented decision, right? We love it when it happens and it’s second and third and we have a pitch where a bloop single, a sharp single, a ball in the gap, and we score two and we tie the game we’re probably still playing right now. Tyler Skaggs (3-1) allowed four hits in seven innings as Houston struggled to make solid contact against his offspeed pitches, especially his changeup. The Astros had outscored the White Sox 27-2 to complete a three-game sweep over the weekend. Los Angeles had lost five of six following a seven-game winning streak. The Angels are 10-1 on the road, but 5-7 at home. Skaggs took the mound to warm up at the start of the eighth inning, but Scioscia pulled him for hard-throwing reliever Justin Anderson, who made his major league debut. Anderson, a 25-year-old Houston native who played high school ball at nearby St. Pius X, was called up from Triple-A Salt Lake on Monday. After quickly retiring his first two batters, Anderson allowed back-to-back singles to George Springer and Jose Altuve before striking out Carlos Correa with an 89 mph slider to end the eighth. Kole Calhoun had an RBI single in the fifth and Justin Upton added an RBI double in the sixth. Gerrit Cole (2-1) retired his first 13 hitters, striking out five, before Valbuena singled. Zack Cozart walked, and Kole Calhoun hit an RBI single. Chris Young hit into an inning-ending double play. Mike Trout singled in the sixth, stole second and advanced on a wild pitch. He scored on Upton’s double to deep center. Cole allowed four hits, struck out eight and walked two. Angels: SS Andrelton Simmons (forearm) is expected to return to the lineup on Tuesday, Angels manager Mike Scioscia said. Simmons was hit by a pitch in Sunday’s game against San Francisco and was held out of Monday’s lineup as a precautionary measure. Gerrit Cole’s 49 strikeouts through five starts tie him for the fifth-most strikeouts ever recorded by a pitcher in his first five starts with a team. He matched hot starts previously set by Nolan Ryan (1989 for Texas) and Bob Feller (1936 for Cleveland), trailing only Herb Score (50 in 1955 for Cleveland), Pedro Martinez (51 in 1998 for Boston), Chris Sale (52 in 2017 for Boston) and Randy Johnson (55 in 1999 for Arizona). Angels: Shohei Ohtani (2-1, 3.60 ERA) will make his fourth start of the season as a pitcher and his second on the road. In his last start on Tuesday against Boston, Ohtani was charged with the loss after allowing three runs on four hits with two walks in two innings. Astros: Charlie Morton (3-0, 0.72) enters his fifth start of the season leading the American League in ERA and ranking seventh in strikeouts per 9.0 innings at 11.88. Morton has gone at least six innings in all four starts, including three scoreless starts and is 3-0 with a 3.14 ERA in five career starts against the Angels.